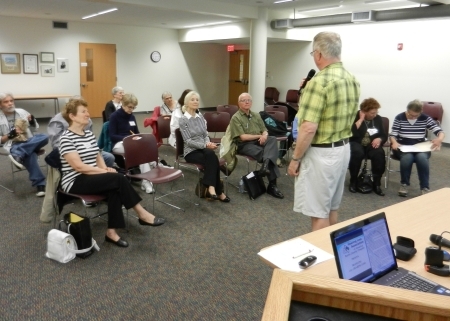 Gail Berkowitz, a member of the Bucks County Chapter of HLAA, spoke about her experiences with hearing loss, with emphasis on traveling issues. A long time hearing aid user, Gail now uses an early version of a hybrid cochlear implant as well as a conventional hearing aid. She has found “Shouting Won’t Help”, by Katherine Boulton, a former senior editor at the New YorkTimes to be of great value. Don’t be reticent about letting staff and others know about your hearing loss. Have spare equipment, not just batteries with you. Insist on the ADA kit of accessories at your lodging, including ships. Member contributed experiences and observations. 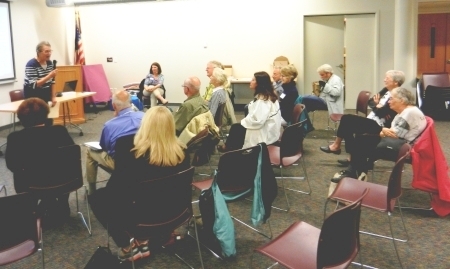 Diana Bender reported that Congressman Brendan Boyle (PA-13) has signed on on as a co-sponsor of the Hearing Aid Tax Credit bill. Chapter members had signed a letter asking him to do so at our last meeting, and we signed another letter thanking him for doing that. Chapter President Tom VanArman has completed his two-year term, and that office goes to Don Groff. Treasurer Elaine Goldberg was reelected to anther term. Thanks to Tom for his years of hard work in chapter leadership. CART transcript available on request to hlaamcc@gmail.com. 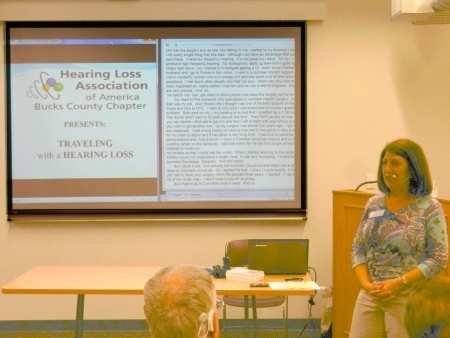 This entry was posted in Meetings and tagged hearing loss, travel. Bookmark the permalink. Unfortunately Elaine and I are heading to our place on Cape Cod on the 26th of this month, so I won’t be at the June meeting. I will be at the convention later that month in St. Louis. So please pass on my regards to everyone for a good summer.